Eyeing a broad swath of metro area beyond Boston city limits, Massachusetts Ready Mix (MRM) has emerged in a healthy market more fragmented than the one leading into the recession. The producer launched in early 2018 from Littleton, a town along the Interstate 495 outer loop, with a fleet of eight new Oshkosh front discharge mixers—blue drums bearing on yellow chassis—and a new, enclosed batch plant at a site steeped in New England concrete production. Massachusetts Ready Mix entered its first season with eight new Oshkosh front discharge mixers bearing 425-hp Cummins ISX12 power plus auto-lubrication systems that precisely grease all target points except the driveshaft. Although the Greater Boston fleet spans both types of mixers, front discharge models suit the moderately hilly terrain in much of MRM’s market area, as well as routine flatwork orders in Medford and other towns near or bordering Boston. The fleet runs on the Five Cubits TrackIt and Command Alkon Integra platforms. MRM is staking claim in a market of shifting ready mixed production leadership, where no operator commands a suburban share exceeding 25 percent. More oval than round, MRM’s delivery radius stretches about 40 miles west of Boston and 50 to 60 miles north-south, into New Hampshire. The target is large by standards of a producer on the edge of a key population center, but reflects Greater Boston’s lack of a straight road grid more typical of a major city; challenging traffic patterns that hamper optimal mixer fleet scheduling; and, restrictive land use terms that tend to confine plants to legacy plots versus better situated greenfields. MRM’s site is strategically located for major thoroughfares leading into Boston, Cambridge and cities along the corridor of Massachusetts Route 128, long known for technology and pharmaceutical companies. The property was home to San-Vel Concrete Corp., a precast/prestressed and ready mixed producer ultimately acquired by Lone Star Industries. The producer’s status as a pillar of New England concrete faded when it became party to 1980s lawsuits over the failure of prestressed railroad ties, placed along Northeast Corridor lines and exhibiting deterioration attributed to delayed ettringite formation. Although fabrication took place closer to the rail lines, tie testing was performed at the home office of San-Vel. The producer’s single-tee-styled wall members remain as the enclosure for one of the MRM headquarters buildings. 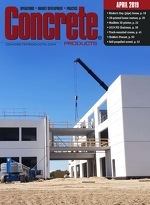 “This site has seen concrete production since 1940. I have worked here for three companies,” observes Tarr. Littleton property dispatches have given him a front row seat to cement company integration and related market consolidation measures, and post-recession fragmentation. His path to MRM began in the early 1970s at Wakefield Ready Mixed Concrete, a family-owned operator with a strong suburban presence. He proceeded to posts with city and/or suburban operators Rosenfeld Concrete and J.H. McNamara. The latter was acquired in the early 1990s by Bardon Trimount, Aggregate Industries’ United Kingdom-based predecessor. He returned to Wakefield RMC ahead of Bardon’s buyout of principals, the Schelzi family, and remained with company’s transition to the Aggregate Industries Northeast Region flagship. Tarr left the producer in 2011 for Benevento Cos., which owns a large quarry northwest of Boston, and tasked him with expanding a ready mixed concrete business alongside existing asphalt production. Grand opening attendees observed MRM’s new batch plant, rated at 150-200 yd./hour; routing of mixers, dumps and tankers along production space abutting maintenance garage and headquarters office buildings; and, the depth of commitment to testing in new concrete lab space and equipment. The project challenged Stephens Mfg. and Concrete Plants Inc. with a greater than normal level of surveying and engineering to ensure the batch plant and hopper building fit on existing structure footprints. The Massachusetts Ready Mix project began in January 2016, as market conditions compelled management to evaluate the potential of a site where San-Vel once ran ready mixed alongside precast/prestressed production. The most recent occupant, Aggregate Industries, vacated a lease—along with equipment far past its prime—in 2012. “The site had an original C.S. Johnson plant with hexagon-shaped bins and eight cement silos in two groups,” notes Tarr. “We knew it had to be rebuilt and found local officials very receptive to eliminating a longtime eyesore.” Permits for an enclosed operation, topping out at 72 feet, turned on a plan in which the footprints of the original batch plant and ramp-served hopper building were maintained. New enclosures for both buildings bring harmony and aesthetics to ready mixed production space never realized from the San-Vel days on. MRM enlisted Maryland-based Concrete Plants Inc. to contour a Stephens Empire transit mixed model and aggregate storage/transfer system to the original building footprints. The batch plant has 300 tons of overhead aggregate storage and equal volume in hopper building ground vessels and vertical storage. It also has 300 tons of cementitious material storage, primarily for Type I/II portland cement plus a blended Lafarge Type I SF (silica fume). MRM is among early customers of North America’s newest powder producer, McInnis Cement, which began production at an eastern Quebec site along the Gulf of St. Lawrence in mid-2017. The Type I/II cement is billed for its low-alkali properties, and trucked from a Port of Providence (R.I.) terminal, McInnis Cement’s charter U.S. distribution point. MRM is well positioned to leverage contractor loyalty and build a brand, thanks especially to a major investment on a site that has harbored ready mixed production for the better part of the past 79 years, plus a seasoned management team whose four members have 120-plus years in the industry. “Every day we hear from a new customer or prospect about a ready mixed order,” affirms Tarr, whose third go around at the Littleton site stands to be his most rewarding. Polarmoist is an alternative to the conventional concrete aggregate moisture measurement devices—capacitive or microwave sensors, typically in direct contact with aggregate in silos, silo feeders or over a conveyor belt. Such contact causes mechanical wear, in turn requiring occasional sensor recalibration and ultimately plate or entire device replacement. Massachusetts Ready Mix plant construction called for a complete overhaul of the legacy property. Concrete Plants upgraded the existing drive over hopper building (above and top, right) to accommodate deliveries by tri-axle and trailer dump trucks. Coarse and fine aggregates are transferred through a new 60-ft. tunnel to a 180-ft. charge conveyor. Massachusetts Ready Mix is an early adopter of the Polarmoist optical moisture sensor, which Polarmatic North America delivers with software to store calibrations and all aggregate data, plus a box to integrate with Command Alkon and other plant control brands. Concrete Plants Inc. positioned the Polarmoist devices at the new Littleton operation to gauge moisture in aggregate passing from overhead bins to a 12-yd. aggregate batcher. As a non-contacting, remote measurement device, Polarmoist uses LED sources and determines moisture content as percentage of water by weight of dry aggregate. Coarse and fine aggregate can contain respective surface moisture by weight at up to 2 percent and 10 percent—figures that exclude absorbed water volumes ranging from 0.5 to 4 percent, according to Polarmatic NA. Aggregate moisture content must be known to fractions of a percent to minimize variability in concrete quality and support cement optimization.